Home > Storage > HP Storage > Storage Area Network Arrays > iSCSI SAN Arrays > HP MSA 1040 10GbE iSCSI 3.5"
The HP MSA 1040 storage array makes 4th generation MSA architecture accessible for entry level storage and virtualization needs. 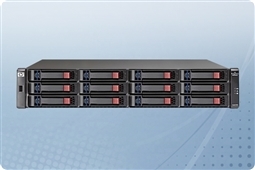 Take advantage of the latest shared storage technologies with a balance of performance and a low price point. The MSA 1040 10GbE iSCSI storage array is perfect for small businesses interested in virtualization or consolidation efforts. Not only does the MSA 1040 SAN offer many of the MSA 2040 features at an more affordable price point, HP also offers a simple upgrade path to convert your MSA 1040 to a MSA 2040 SAN as your needs and budget dictate. The MSA 1040 storage system offers 4 models: MSA 1040 8Gb Fibre Channel, MSA 1040 12Gb SAS, MSA 1040 1GbE iSCSI, and MSA 1040 10GbE iSCSI. Each model offers 12-bay 3.5” or 24-bay 2.5” chassis options. Get the latest technology without breaking your budget with an MSA 1040 iSCSI storage array today! Wondering if the HP MSA 1040 10GbE iSCSI 3.5” Bay SAN (Storage Area Network) array is right for your business continuity and budget? Check out our Survival Guide: Avoiding A Data Apocalypse today! 6TB (6 x 1TB) 7.2K 6Gb/s NL SAS 3.5"
2.7TB (6 x 450GB) 15K 6Gb/s SAS 3.5"
Are you looking for the same balance of 10GbE iSCSI performance and affordable price point in a 24-bay 2.5" chassis? Please check out our SFF MSA 1040 1GbE iSCSI models.